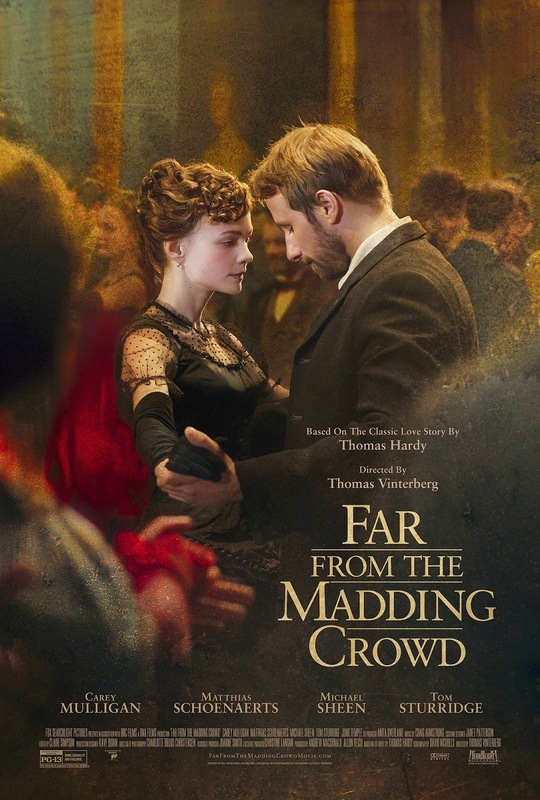 There were a lot of questions surrounding director Thomas Vinterberg's interpretation of Thomas Hardy's Far From the Madding Crowd from me personally. Having never touched the source material I didn't have a clue what surface the story skimmed and given this was clearly a period piece intended for a specific audience with a specific purpose I wondered why it might be making its debut so early in the year. Would Fox Searchlight not even care to grab a costume design nomination or did they know this would likely get lost in the shuffle of awards season? In all respects, the right choices seem to have been made as questions of quality and profundity surround every turn in the film. Clearly, this is melodrama, but is it simply melodrama with pedigree because of its Victorian era-setting? It is easy to defend these older works, these definitive works as they made way for the conventions we see run rampart today, but the key for modern film adaptations, and maybe this is unfair, is that they find something new and fresh to bring to the table, a reason to tell this story again. Of course, many will testify that simply keeping these stories alive is reason enough to tell them again and while I'm almost positive Vinterberg and screenwriter David Nicholls have streamlined much of Hardy's novel in order to make it a two-hour love story modern audiences may understand without the hindrance of cultural differences it still feels very unmoving despite largely dealing with life-changing events that are clearly meant to appeal to our emotions. There are the usual good things to be said about the cast, Craig Armstrong's beautiful score and the gorgeous, natural cinematography of Charlotte Bruus Christensen, but when your last film was The Hunt, a movie that elicited a more visceral reaction than any other in recent memory, one would think your follow-up might evoke more than just a groan of complacency despite touching on some always relevant and interesting themes. Bathsheba Everdene (Carey Mulligan) is instantly infatuated with Sgt. Frank Troy (Tom Sturridge). It is 1870 in the countryside of Dorset, England. Bathsheba Everdene (Carey Mulligan) has come to work the summer with her aunt, Mrs Hurst (Tilly Vosburgh), and in the process meets Gabriel Oak (Matthias Schoenaerts). Gabriel is a sheep farmer who, with the savings of a frugal life and a loan, has leased and stocked a sheep farm. He falls quickly for Bathsheba and requests her hand in marriage soon after, but she refuses as she values her independence too much. Shortly after her denial, Gabriel has the terrible luck of a young and untrained sheep dog driving his flock over a cliff, essentially ruining him. Gabriel sells all he has to settle his debts, but has nothing left in the end. When Gabriel again meets Bathsheba their fortunes have changed considerably. Bathsheba, having recently inherited her uncle's estate is now wealthy, and hires Gabriel as her new Shepherd on said estate. In her new position of wealth Bathsheba has also captured the attention of her neighbor, a prosperous and mature bachelor named William Boldwood (Michael Sheen). The most engaging parts of the film come in how it plays with the unspoken middle ground between Bathsheba and Gabriel when discussing what she should do after Mr. Boldwood offers her a marriage proposal as the two of them try to navigate a professional relationship without allowing their history to seep in. In another turn of chance, luck, circumstance or however you choose to look at it Bathsheba runs into the handsome and reckless Sergeant Frank Troy (Tom Sturridge) one night. Adding another layer to her increasingly complicated emotions and the passion that drives them Bathsheba makes unconsidered decisions. The attraction to these three very different suitors sets in motion a chain of events that are defined not by the real world, but more the mythical, existential pull of our emotions. What truly inspires happiness rather than what looks best on paper. Given the strong emotional pull that dictates the majority of the actions in the film it seems even stranger that the audiences own emotions are left uninspired. This is not to say there aren't specific moments of transcendence, but they are simply too few and far between for it to register as something substantial by the time the credits begin to roll. Rather, we simply take the events that Far From the Madding Crowd presents and accept them for what they are, investing only long enough to make sure our pick for which one we think Bathsheba should end up with does indeed prevail. As to the striking moments, the tragedy of Mr. Oak in the beginning is especially notable and Vinterberg captures it with unrelenting brutality both in the actions of Oak's herd and in his reaction. Furthermore, the aforementioned dialogue between Bathsheba and Gabriel in the intermissions of Bathsheba's other romantic exploits hold the most weight as it is these two we root for. The question that consistently rises from these interactions is why does Bathsheba continue to deny herself what she truly wants, but the answer may be more complicated in that despite composing her independent, beautiful and headstrong facade daily Bathsheba doesn't seem to actually know what she wants. While her pride is worthy of her position, especially in this point in time, that pride negates her from allowing her inherent emotions to take over. I understand Bathsheba's state of mind, truly, as she is driven by proving her naysayers wrong. More to this point is that marriage was not considered a necessarily meaningful institution at the time, but was more for advantage and definition of class, a classification that held much societal meaning. Given Bathsheba relied on no one nor needed anyone to support her she was free of such obligation thus rendering Boldwood's offer moot despite him being the most eligible bachelor in the district. It is Gabriel Oak (Matthias Schoenaerts) who holds Ms. Everdene's heart though. Thus what we have left are the competing affections of the subtle Gabriel and the lustful intrigue that is presented by Sgt. Troy. We are initially inclined to feel sorry for Troy, but his forward attitude and cocky confidence make him the least favorite right off the bat. Naturally, there are bad decisions to be made and regrets to be had, but these necessary complications for both dramatic and story purposes give us a glimpse of the main idea of the film. While Troy is painted in shades of gray, he is really just the victim of both good and bad fortune. This brings us to the question of if there really are good and bad people or is each individual simply a product of their consequences? This has a nature versus nurture aspect to it, but more than that it explores how these qualities, whether innate or a product of personal experiences, change over time. This would somewhat indicate a leniency towards the nurture side of our behavior, but I digress. It is fascinating though because it is the reactions to circumstances that bring our characters around to these different beats in their lives, these decisions that are life-changing even if they don't realize the impact in the moment. What might Bathsheba and Gabriel's lives been like had she accepted his offer of marriage the first time? Would they still be the same people, as deeply in live with one another as they are at the end of the film, had they not been through the trials the film presents or would Gabriel have grown to actually resent Bathsheba as she predicts? 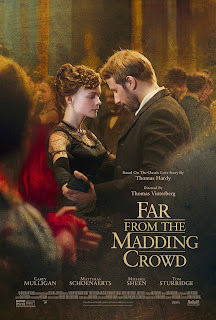 For exploring interesting ground and featuring solid performances from the principal cast that stimulates such contemplation Far From the Madding Crowd is good for creating water-cooler conversation while helping us all to sound expertly pretentious at the same time. Despite Mulligan and Schoenaerts glistening beautifully against the barrage of magic hour shots Vinterberg captures though, it is not the exploration of relationships and love that keeps us on the hook here, but more its flair for the sensationally dramatic that can't help but feel a little cheap despite the productions obvious pedigree.